Dr. Boutin began serving as Director, Albemarle-Pamlico Sounds Program for the North Carolina Chapter of The Nature Conservancy in 2016. In this capacity, he oversees all aspects of protection, science, stewardship, restoration and community relations for northeastern North Carolina. He began his career with the North Carolina Division of Marine Fisheries where he co-authored the 2010 update of the Coastal Habitat Protection Plan. In 2009, he joined The Nature Conservancy’s North Carolina Chapter to lead a large-scale, multimillion dollar, multiagency effort to restore oyster reefs and wetlands on protected lands in the Albemarle-Pamlico region. 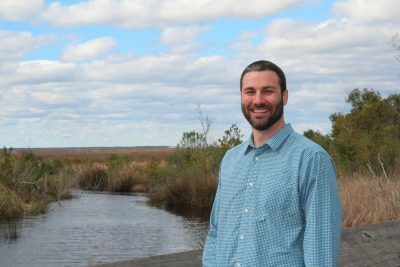 Beginning in 2012, he led research to identify the impacts of managed freshwater flows on key physical, chemical, and biological indicators in South Florida estuaries with the South Florida Water Management District. Prior to his current position, Dr. Boutin worked as Director of Conservation Programs for the Delaware Chapter of The Nature Conservancy where he provided leadership and oversight of land, water, oceans, and climate initiatives. Dr. Boutin holds a Ph.D. in Marine Bioscience from the University of Delaware and a B.S. in Marine Biology from the University of North Carolina at Wilmington.